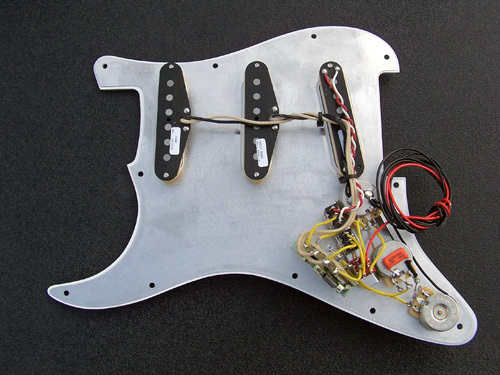 Our complete pickguard assembly includes everything you will need, it is ready to drop into your favorite Strat® by simply hooking up the hot wire (audio) and a couple of ground wires. It is loaded with genuine Seymour Duncan pickups, an SSL-5T (Tapped) bridge pickup, SSL-1 (Rw/Rp) middle pickup and a SSL-1 neck pickup. It is all assembled with genuine Fender® accessories along with top quality CTS potentiometers, Orange Drop polyester film tone capacitors and a CRL pickup selector switch. We do not stop short on the quality of a single component. Switch 1: Toggles between full output and lower output of the tapped SSL-5T bridge pickup. The tapped lower output of the SSL-5T is comparable to a SSL-1 true vintage pickup and the full output selection provides the full, higher output with more sustain and great harmonics of the SSL-5. Switch 2: Toggles on or off the neck pickup no matter what position the 5-way pickup selector switch is in. 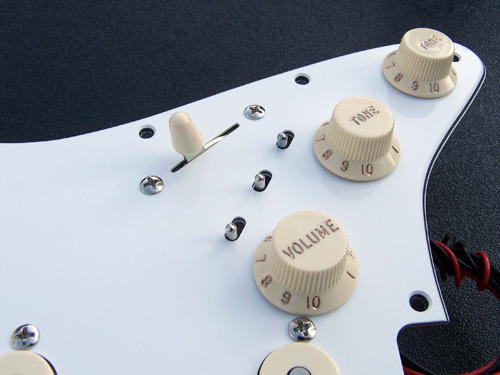 This mod gives you two more pickup selection options from the standard 5 which is the same as our Gilmour Black Strat® modification. Switch 3: "Direct Through Mod". 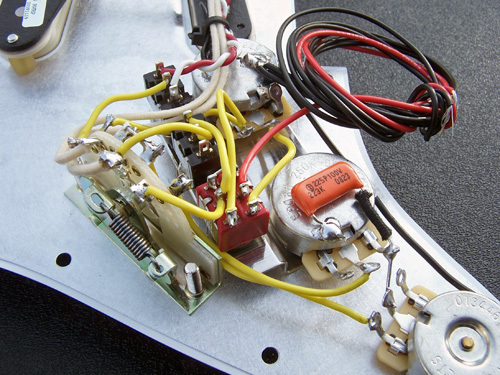 With this switch activated the output from the pickups is sent directly to the output jack bypassing the volume and tone potentiometers and eliminating any of their signal attenuation. This is similar to Fender's "No Load" tone potentiometers, but with them when they are set at 10 the pickup signal simply "bypasses" or does not impart a load through the the tone potentiometers, and to not have the "No Load" potentiometers bypassing you must crack down the setting down just below 10 a very small amount and then it will operate as a normal tone potentiometer. A "No Load" tone potentiometer set at 10 is in "bypass" mode. So this option is similar but yet different in how it is applied. The "Direct Through Mod" option allows the full flavor, output and character of the pickup to be sent directly to your amp. The standard 11 hole pickguards we offer for this assembly are fully shielded as they come from Fender® with the exception of the 1 Ply Black which is only shielded in the control region and is manufactured by Warmoth Guitars. The '62 vintage and '57 vintage pickguards require a separate aluminum pickguard shield which is to be added extra if so desired and is recommended. Use the separate "Add to Cart" buttons found below for addition of these pickguard shields to your order. 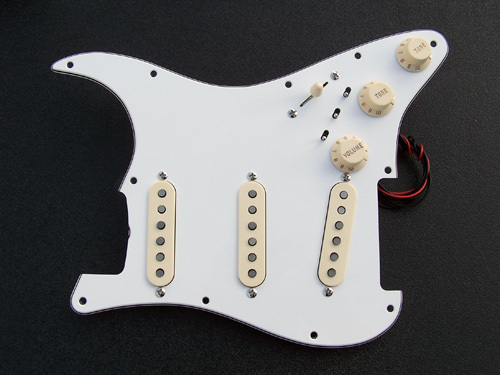 With this particular customized pickguard assembly these aluminum pickguard shields are also fully customized to accommodate the three recessed mini-toggle switches. 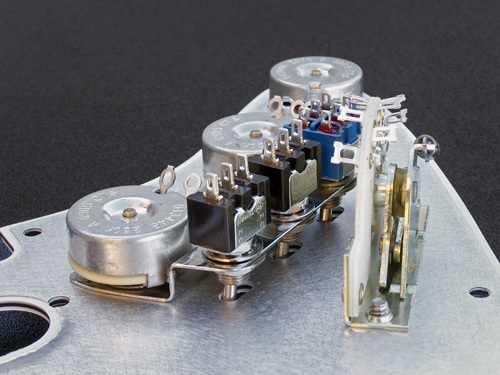 Pickup Selector Switch: CRL 5-Way. Tone Capacitor Options: Orange Drop Polyester Film Capacitors. Click here for information on tone capacitors and here is a link to a video that explains How Tone Capacitors Work. 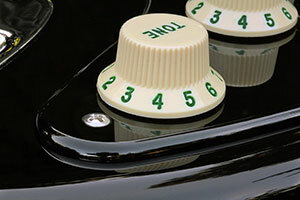 Optional customized NOS Genuine Fender® Vintage '62 style Green Lettered / Numbered control knobs. 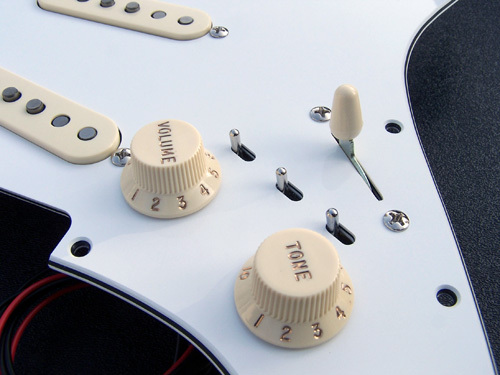 Very similar in style to what you would find on a '62 Strat® yet customized in our shop. Use the "Add On" Add To Cart button to the left to add this unique feature to your pickguard assembly. 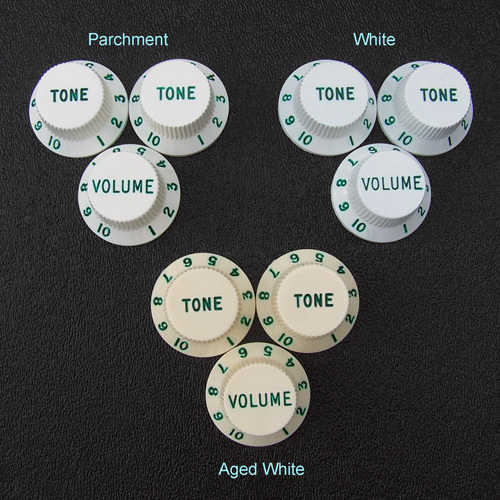 We can customize these knobs with any selection of Accessories color from White, Parchment or Aged White. To add the aluminum pickguard shield for the '62 vintage pickguard use this Add To Cart button. This is not a standard shield, it has been customized to match the pickguards three mini-toggle switch slots. To add the aluminum pickguard control area shield for the '57 vintage pickguard use this Add To Cart button. This is not a standard shield, it has been customized to match the pickguards three mini-toggle switch slots.